Reynolds the foremost painter of the English School, takes that place by virtue of his portraits. He achieved an extraordinary popularity, not merely because of his work, but also because of his great personal charm, which gained him the patronage of the King and the friendship of such men as Johnson, Garrick, Goldsmith, Gibbon, and Burke. He was a magnificent copyist: indeed, Sir Walter Armstrong suggested that one of the Rembrandts in the National Gallery is, in reality, a copy made by Reynolds. At the same time he assimilated the styles of the Old Masters, and reproduced their best methods upon his original canvases. In like manner, he could gather all the best of his subject and picture it in a manner graceful in composition and beautiful in colouring. In these respects, as in the delicacy of his flesh painting, his portraits have never been surpassed, and it is easy to understand that the great folk of his time were anxious to employ his genius. So popular indeed was he, that in certain years he completed three or four portraits every week, and even when he became the first President of the Royal Academy, and worked less at painting, he still produced an average of over a portrait a week. Undoubtedly his delightful child studies must have been painted for sheer pleasure. They show that he was just as happy in portraying the innocent beauty of youth as the maturer qualities of age. In such a picture as "The Infant Samuel," therefore, we have a combination of his qualities - the marked influence of the Italian School, the felicitous inspiration of the subject, and the beautiful colouring and dexterous workmanship which glorify the creations of his mind. I have found a painting of the Infant Samuel at a sale. 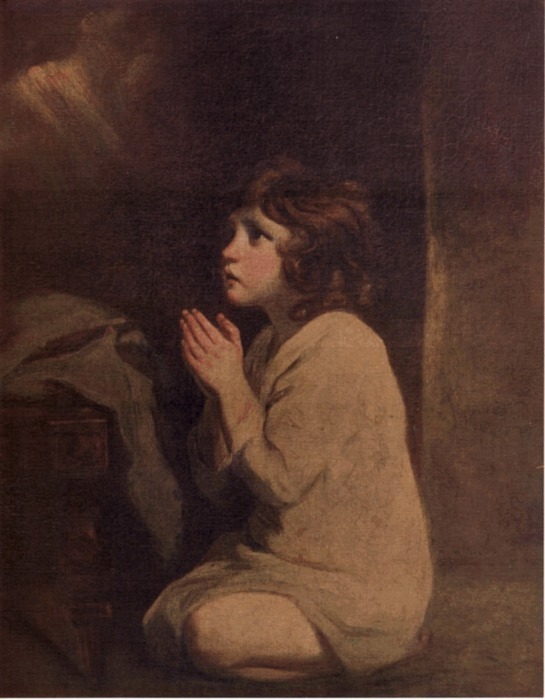 It has the frame and on the back it has "The Infant Samuel At Prayer, Sir Joshua Reynolds and National Gallery London. What is something like this worth?